Tariq Sheikh describes the role of youth in the revolutionary movement that, since late-December 2018, has engulfed the country. If this youth revolution succeeds, it will be different from previous experiments, ridding Sudan of the cycle of a coup, followed by revolution, followed by coup. The following text from Sudanese journalist Tariq Sheikh describes the role of “youth” in the revolutionary movement that, since late December, has engulfed the country. It was translated by Joe Hayns and N.S. from the Arabic original, as published by OrientXXI, with influence taken from Nada Yafi’s French translation. On the morning of the 25th of December, in the al-Jazira province, close to Khartoum, Omar al-Bashir’s presidential motorcade hurtled forward. Its passage was then stopped by a group of women crying "Āraḥal! Āraḥal!" ("Leave! Leave! "), as young boys shouted at the cars’ tinted windows: "Freedom, Peace, and Justice: ath-Thūrah khīār al-Shʿab" – Revolution, Choice of the People! The day was a threshold in the history of Sudan; the ground appeared to suddenly to collapse beneath the head of state’s feet. For the first time since the 1989 coup that brought him to power, al-Bashir heard from those women and children, directly, clearly, the voice of his people. The voice was alarming enough that the president fled the ceremony he’d been attending, back to the capital – the situation was hardly better there, or in any of the twenty five other towns and cities that had, with startling simultaneity, rebelled against the regime. Every day that passes reinforces Sudanese conviction: the page of Omar al-Bashir is being turned. For the first time in three decades, since the late-December uprising, the president no longer has before him the field of the possible. A groundswell of anger, like the trembling of the earth, has moved Sudan's cities, big and small – "Āraḥal! Āraḥal!" With time, not only has the wall of fear appeared to have fallen; fear itself has changed sides, as the rows of regime forces make misstep after misstep. With the fall, the people are bolder; the regime’s grip on power, weaker. The president’s promises of reform have come to nothing, any more than accusations against ‘traitors to the nation’, ‘saboteurs’, and ‘agents provocateurs’. The people have summarised their determination with a chant against al-Bashir – against his autocratic rule, and the murderous wars in the Darfur, South Kordofan and the Blue Nile – words that have long been spoken privately across the country: Tasquṭ Bas! (Just Get Out!). The end of this era will conclude the first and most disastrous of any Muslim Brotherhood rule in the Arab world. With the rising power of the popular movement has increased the activity and the coordination of the major opposition parties, especially the Nid’a as-Sudan (Sudan Call) alliance, as led Sadiq al-Mahdi’s National Umma Party, and the National Consensus Forces, led by the Sudanese Communist Party, itself allied with the Sudanese Professionals’ Assembly [on which, see Sheikh’s earlier essay]. Everyday the political movement’s pressure increases for the incumbent National Congress Party, and its leader, al-Bashir, to step down. This movement of political forces repeats again the methods of the two previous popular revolutions. The first removed Ibrahim Abboud in October 1964, and the second, in 1985, toppled the power of General Jaafar Nimeiri. There is, though, a new configuration today. In the past, the revolution started in the capital and was carried by the unions and the intelligentsia, with parties following. Their components were without doubt more politically mature than those of the current uprising. The current revolution represents however an astonishing phenomenon: the unbridled determination of the youth. The uprising has caught the government off guard, by its strength, by the level of consciousness, and the organisation of the masses, as accompanied by the opposition parties. A popular movement clear in its objectives, and the will to build an alternative future for Sudan — ‘Freedom, Peace, and Justice’. The towns and the provinces of the country have surpassed Khartoum and the country’s second city, Wad Madani, as the leaders of change, fighting against a regime of steel and fire; and it is the emergence of the youth which has above all marked this uprising, surprising all the antagonists, both the government and the opposition. Before these events, the government had made a generation in its own image, borrowing the Islamic curriculum of the Muslim Brotherhood. Religious thought suffused every aspect of the state, masking the corruption of a class and a parasitic capitalism that stole the resources and the riches of the country. This atmosphere, the denial of the freedoms, was such that the older generation – desperate for change – had considered the younger generations lost; but the younger generation are today driving a popular revolution, having shaken off the Brotherhood’s attempt as breaking past from present. The same youth that had spent thirty years “inside the bottle” of the Brotherhood is now coming to the street, led by new values for a Sudanese society based on a new understanding. Sudanese youth and students have long history of political rebellion. In 1948, the independence movement emerged first from the Graduates’ Congress Conference, born following the 1924 revolution, as ferociously repressed by the forces of British colonialism. The brutally crushed armed revolt left the revolutionaries abandoned, with the youth then taking inspiration from the non-violent struggle of Mahatma Gandhi (hence the name, ‘Congress’). This long period of maturation would last twenty-four years, before a new explosion in the late-1940s which, in time, led to the independence of Sudan in 1956. It's with some irony then that today's youth-led movement began only days before Sudan's independence day (1 January). It took thirty long years for the youth to explode in anger against Bashir, revolting against the first Muslim Brotherhood-ruled state in the Arab World. Ironically, previous generations of graduates benefited from an education and the institutions of a modern state, and a relative freedom, even under the shadow of empire – all things that the Islamists relentlessly demolished, and from the first days of taking power. Repression is now widespread, education is in shambles, and public facilities are in ruin. If the Islamic Movement's rule will be remembered at all, it will be for its mistakes. Generations born under the rule of the Muslim Brotherhood faced a gradually decaying state. They were between two worlds, one of an inherited culture speaking of a glorious Sudan, in which, as al-Bashir says, ‘al-Thī kān bekhīruh – all is well – and the world of Sudan's daily, lived reality, where corruption is rife, and manufacturing, education, and health are rapidly declining. From these worsening conditions, a new generation is rising, dreaming of a better future. Between these two worlds, a spoken world and a lived world, this generation is building a different way. If the previous popular revolts ended with confessional governments, the current movement is led by youth seeking a new society, far from religious rul: a new state of “Freedom, Justice and Peace”, which is to say a state without religious or confessional compulsion, for each and every citizen, regardless of religious, tribal or communal belonging. This revolutionary youth is not bound by the two previous uprisings, which put an end to their participants’ aspirations. If this youth revolution succeeds, it will be different from previous experiments, ridding Sudan of that cursed cycle of a coup, followed by revolution, followed by coup, which has damaged both the development of the political sphere of the country. The youth leading the revolution find themselves pulled between various forces, including representatives of the confessional opposition parties, the largest parties in the country, and themselves part of the ancien regime: Sadiq al-Mahdi's National Umma Party, and al-Mirghani's Democratic Unionist Party, both of which represent the lineal successors of previously overthrown regimes. Several large groups amongst the youth of the revolutionary movement see these two confessional forces as partly responsible for the country’s ongoing ruin and backwardness – hence the categorical rejection of al-Mahdi's call for 'soft landing' rather than an overthrow of the regime. The presence of the sons of al-Mahdi and al-Mirghani's sons in high government offices, assisting President Omar al-Bashir, is seen as unholy alliance, and a betrayal of popular ambitions to change the regime. The youth see in the agendas of both these parties and the Islamic movement an implicit agreement to oppose emancipation, progress, and modernisation. Moreover, the chants and the cries of the masses, and the slogans shared in social media, echo the the literature of the Sudanese Communist Party (SCP), which has always remained opposed to al-Bashir's regime. This is what makes the two confessionalist parties suspicious of the current movement, adverse to lending it their support, despite the presence and the participation of their membership in it. The youth’s dream of change, and their seemingly spontaneous use of slogans of poets and intellectuals associated with the SCP and previous street movements – amongst them, Mahjoub Sharif and Mohammed al-Hasan Salim (known popularly as “Humaid”) — put them on the same historical path of party. And, there is another knot that ties the youth and the Communist Party, along with other progressive forces in Sudan. It is the strong belief that the only way out of Sudan's crises is through establishing a civil state, based in the rule of law, and a respect for all races, tribes, and cultures. It is here that we can see what differentiates this current revolution from all previous revolutions and popular uprisings, in its social components, its goals and ambitions. A newer, more realistic vision, drawing from the surrounding world a desire for modernization and development, and a new power through easy access to information. The revolution is becoming revolution of values, as shown the youth's triumphant chants, and its reaching out to all social strata. The mass, youthful revolution in Sudan, despite its increasing momentum, still has many battles, obstacles, and challenges on the road, from counter-revolutionary forces domestically, regionally, and perhaps internationally. This revolution cannot though hope for much solidarity from the Arab world, and especially not from those governments who fear that such real, tangible change is contagious. It still, however, hopes for international solidarity, from those seeking peace in the post-industrial world. The translators would like to dedicate their work to memory of Colin Barker, whose own encouragement of youth, through both his curiosity and his patience, will remain a model for socialist thought and organising. 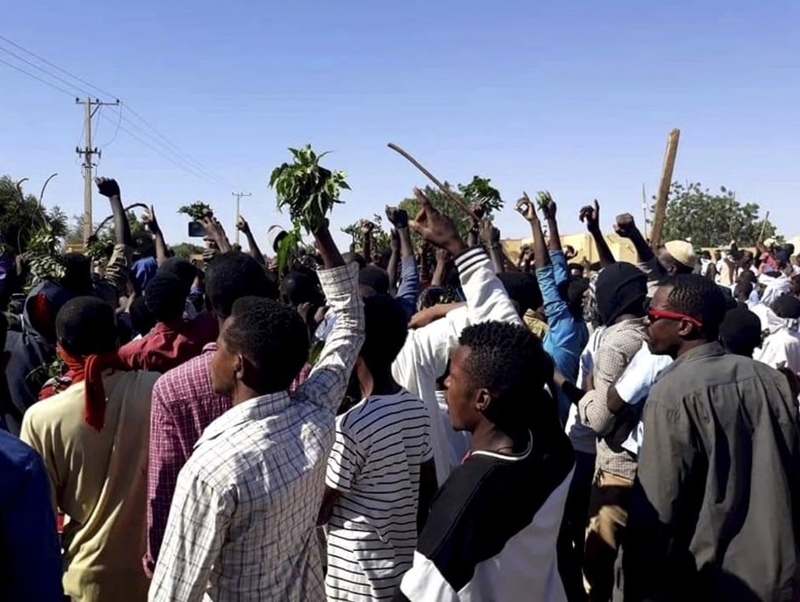 On the racial politics of the regime’s anti-protester rhetoric, see ‘Sudan’s traitors, saboteurs and masakeen’, from the StillSudan blog. On the continuities of British rule in contemporary Sudan, see Sara Mohammed’s ‘Sudan’s third uprising: is it a revolution?’ published recently by Le Monde diplomatique. ‘Backwardness’ is perhaps a too literal rendering of the Arabic word ‘التخلف’; ‘underdevelopment’ though is less used in Arabic than English.